on Saturday, 15 February 2014. Susan B. Anthony was born and raised in West Grove, near Adams, Massachusetts. She was the second oldest of seven children—Guelma Penn (1818–1873), Hannah Lapham (1821–1877), Daniel Read (1824–1904), Mary Stafford (1827–1907), Eliza Tefft (1832–1834), and Jacob Merritt (1834–1900)—born to Daniel Anthony (1794–1862) and Lucy Read (1793–1880). One brother, publisher Daniel Read Anthony, would become active in the anti-slavery movement in Kansas, while a sister, Mary Stafford Anthony, became a teacher and a woman's rights activist. Anthony remained close to her sisters throughout her life. Anthony's father Daniel was a cotton manufacturer and abolitionist, a stern but open-minded man who was born into the Quaker religion. He did not allow toys or amusements into the household, claiming that they would distract the soul from the "inner light." Her mother Lucy was a student in Daniel's school; the two fell in love and agreed to marry in 1817, but Lucy was less sure about marrying into the Society of Friends (Quakers). 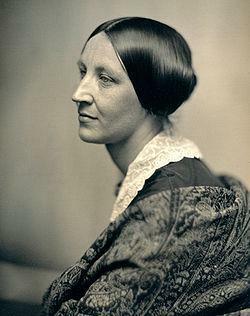 She attended the Rochester women’s rights convention held in August 1848, two weeks after the historic Seneca Falls Convention, and signed the Rochester convention’s Declaration of Sentiments. Lucy and Daniel Anthony enforced self-discipline, principled convictions, and belief in one's own self-worth. Susan was a precocious child, having learned to read and write at age three. In 1826, when she was six years old, the Anthony family moved from Massachusetts to Battenville, New York. Susan was sent to attend a local district school, where a teacher refused to teach her long division because of her gender. Upon learning of the weak education she was receiving, her father promptly had her placed in a group home school, where he taught Susan himself. Mary Perkins, another teacher there, conveyed a progressive image of womanhood to Anthony, further fostering her growing belief in women's equality. In 1837, Anthony was sent to Deborah Moulson's Female Seminary, a Quaker boarding school in Philadelphia. She was not happy at Moulson's, but she did not have to stay there long. She was forced to end her formal studies because her family, like many others, was financially ruined during the Panic of 1837. Their losses were so great that they attempted to sell everything in an auction, even their most personal belongings, which were saved at the last minute when Susan's uncle, Joshua Read, stepped up and bid for them in order to restore them to the family. In 1839, the family moved to Hardscrabble, New York, in the wake of the panic and economic depression that followed. That same year, Anthony left home to teach and to help pay off her father's debts. She taught first at Eunice Kenyon's Friends' Seminary, and then at the Canajoharie Academy in 1846, where she rose to become headmistress of the Female Department. Anthony's first occupation inspired her to fight for wages equivalent to those of male teachers, since men earned roughly four times more than women for the same duties. In her youth, Anthony was very self-conscious of her looks and speaking abilities. She long resisted public speaking for fear she would not be sufficiently eloquent. Despite these insecurities, she became a renowned public presence, eventually helping to lead the women's movement. On January 1, 1868, Anthony first published a weekly journal entitled The Revolution. Printed in New York City, its motto was: "The true republic—men, their rights and nothing more; women, their rights and nothing less." Anthony worked as the publisher and business manager, while Elizabeth Cady Stanton acted as editor. The main thrust of The Revolution was to promote women’s and African-Americans’ right to suffrage, but it also discussed issues of equal pay for equal work, more liberal divorce laws and the church’s position on women’s issues. The journal was backed by independently wealthy George Francis Train, who provided $600 in starting funds. His financial support ceased by May 1869, and the paper began to operate in debt. Anthony insisted on expensive, high-quality printing equipment, and she paid women workers the high wages she thought they deserved. She banned any advertisements for alcohol- and morphine-laden patent medicines; all such medicines were abhorrent to her. However, revenue from non-patent-medicine advertisements was too low to cover costs. In June 1870, Laura Curtis Bullard, a Brooklyn-based writer whose parents became wealthy from selling a popular morphine-containing patent medicine called "Mrs. Winslow's Soothing Syrup", bought The Revolution for one dollar, with Anthony assuming its $10,000 debt, an amount equal to $171,000 in current value. Anthony used her lecture fees to repay the debt, completing the task in six years. Under Bullard, the journal adopted a literary orientation and accepted patent medicine ads, but it folded in February 1872. In 1869, long-time friends Frederick Douglass and Susan B. Anthony found themselves, for the first time, on opposing sides of a debate. The American Equal Rights Association (AERA), which had originally fought for both blacks’ and women’s right to suffrage, voted to support the 15th Amendment to the Constitution, granting suffrage to black men, but not women. Anthony questioned why women should support this amendment when black men were not continuing to show support for women’s voting rights. Partially as a result of the decision by the AERA, Anthony soon thereafter devoted herself almost exclusively to the agitation for women's rights. On November 18, 1872, Anthony was arrested by a U.S. Deputy Marshal for voting illegally in the 1872 Presidential Election two weeks earlier. She had written to Stanton on the night of the election that she had "positively voted the Republican ticket—straight...". She was tried and convicted seven months later, despite the stirring and eloquent presentation of her arguments that the recently adopted Fourteenth Amendment, which guaranteed to "all persons born or naturalized in the United States" the privileges of citizenship, and which contained no gender qualification, gave women the constitutional right to vote in federal elections. Her trial took place at the Ontario County courthouse in Canandaigua, New York. The sentence was a fine, but not imprisonment; and true to her word in court, she never paid the penalty for the rest of her life. The trial gave Anthony the opportunity to spread her arguments to a wider audience than ever before. Anthony toured Europe in 1883 and visited many charitable organizations. She wrote of a poor mother she saw in Killarney that had "six ragged, dirty children" to say that "the evidences were that 'God' was about to add a No. 7 to her flock. What a dreadful creature their God must be to keep sending hungry mouths while he withholds the bread to fill them!" In 1893, she joined with Helen Barrett Montgomery in forming a chapter of the Woman’s Educational and Industrial Union (WEIU) in Rochester. In 1898, she also worked with Montgomery to raise funds to open opportunities for women students to study at University of Rochester.